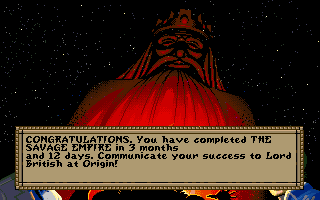 The CRPG Addict: Savage Empire: Won! I'm always trying, but he never writes back. Finish uniting the tribes, including three I had not yet visted. Gain access to the ancient city of Kotl, learn the secret of Eodon, and power everything down. Lead the united tribes on a final assault against the Myrmidex queen. None of the remaining tribes--the Neanderthal-like Haakur, the white Jukari, and the lizardlike Sakkhra--had any particular plot relevance. I just had to visit them, talk to their chiefs, and do whatever quest they gave me with the UNITE keyword. The Jukari chief asked me to recover a "sacred hide" from a cave that had recently been blocked by the same lava eruption that had killed the chief's father. To get over the lava, I had to use a...wait for it...fire extinguisher. By spraying it on various patches, I made "hard spots" that allowed my party to step across. I don't recommend trying this with real lava. Stupid fire extinguisher doesn't even put out an actual fire. ...wanted me to recover his dead son's shield from a spider-infested cave south of him. To clear out the spider webs, I had to use torches, which was more of a pain in the neck than you might imagine. Unable to find any unlit torches in the various villages, I had to schlep all the way back to Rafkin's laboratory and the tar pits nearby. Tar applied to cloth applied to tree branches created torches. It was almost worth it. The torches, applied to batches of spider webs, produced one of the best (and most satisfying) animations we've seen so far in RPG history. In the cave, I encountered Myrmidex for the first time. I had expected them to be humanoid ants, but they looked more like bees. They weren't tough to kill, but they attacked in swarms. Anyway, I recovered the shield and returned it to the chief for his allegiance. 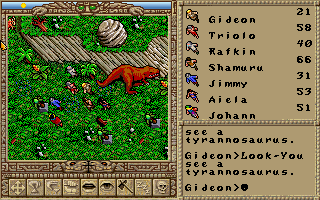 I handled the Sakkhra after exploring Kotl, but in any event they needed me to get rid of a Tyrannosaurus Rex who was preventing them from getting to their fruit orchards. I knew from previous experience that T-Rexes can't be killed, but when I got to his location, he fortunately was loafing around under a giant boulder on a cliff. An explosive thrown in the right location brought the boulder crashing down on his head. The party kills another member of an endangered species. Finding the entrance to Kotl was a matter of putting Aiela's gem on a pedestal, which caused the stairway to open. It took a while to find the stairway at the bottom of the mesa, but it turned out to be conveniently located a few steps away from the teleporter hub. In the entryway, I found a headless automaton and no way to proceed. I had to return to Tichticatl and talk to the deposed shaman to recall that the head was in the city's treasury. Once I had it, I returned to the hidden city and activated the automaton. It was named Yunapotli, and it joined my party and opened the door to the city. A few steps into the city was a hologram of a Kotl named Katalkotl. 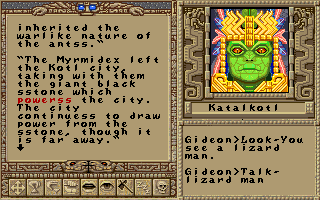 Between Katalkotl and Yunapotli, they filled in the missing gaps in Eodon's backstory: The Kotl were a lizard-like race that inhabited the underground city millennia ago. Harnessing the power of a black moonstone, they created automatons to serve them. Finding that the automatons weren't enough, they genetically-engineered the Myrmidex from ants, trusting that their strength and obedience would make them good workers. Instead, the Myrmidex revolted and carried away the moonstone (which continued to power the city from a distance). A lot of grief would have been prevented if you'd just been willing to do your own housecleaning. Seeking more servants, Katalkotl traversed the world and lured denizens of various tribes to the city (how his travels brought him in contact with both Neanderthals and Aztecs, who existed more than 35,000 years apart, is unexplained). The human servants also grew discontented with their lot in life and eventually fled, forming the various tribes of the valley. Later, the Myrmidex returned and sacked the city. A few surviving Kotl fled to the hills and became the Sakkhra. The city was enormous and I'm sure I didn't explore half of it. Scattered around the various rooms were healing crystals, which instantly restore one character to perfect health, black staffs, and "devices" that turned out to be explosive devices. I loaded up on these and used them for most of my explosive needs in the rest of the game, though they had a unfortunate tendency of blowing up in my hands and damaging my party even after I had supposedly thrown them. I think this was a bug. Finding items among the debris of an ancient battle. 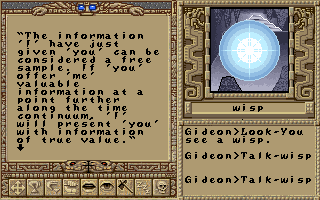 In one room, I encountered a wisp, who continued the same story that Ultima VI delivered about wisps being projections from the Xornite dimension. It said it was in the area to study the power distortions created by the Kotl's harnessing of the moonstone. It indicated that Eodon was actually on Earth, but sucked outside the normal space-time continuum by the energy distortions, and it worried that if the moonstone wasn't shut down, the resulting instability would result in "destruction of large regions of the multiverse." The evil Dr. Spector, invincible in his force field, was guarding a bridge that led to the city's control room. Unable to pass him, I had to go through a maze of teleporters and walls to access the room from another direction. My explorations brought me into combat with automatons, robotic dinosaurs, and "serpent women." When I reached the control panel, I smashed it. This shut down the generators and all the city's automatons, including Yunapotli. He had a sad farewell. He was replaced in my party with Dr. Spector, who had snapped back to sanity. I was a bit annoyed, as I had been looking forward to killing Spector and his puppet chief. When I returned to Tichticatl, I at least had the satisfaction of hearing that when his force field disappeared, his own people had ripped Huitlapacti apart. Anyway, the city started collapsing, so I had to make a beeline for the exit. The entrance disappeared as soon as I left, taking probably a bunch of cool stuff with it. Next time I have to remember to finish exploring before smashing the load-bearing control panel. I hate when I turn off the lights in my house and the walls fall down. 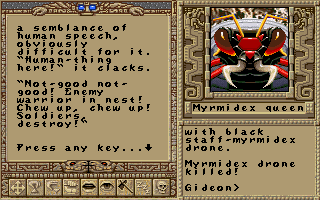 Spector stressed the importance of uniting the tribes and destroying the Myrmidex queen and their moonstone. I finished the other tribal quests in short order, then headed for the Hill of the Drum. Banging on the giant drum that some guy had created for me out of an animal skin, I summoned the tribes to war and triggered the endgame sequence. I soon found myself in the caves of the Myrmidex. Despite all the build-up, none of the warriors from the tribes appeared anywhere, but I assume they were off somewhere, thinning the herd and making my job easier. Battling Myrmidex. Towards the end of the game, I got lazy with equipment. I don't even think Aiela and Johann have weapons and armor. ...and then I killed her in about two blows. 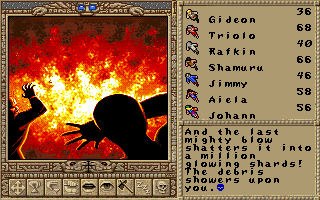 You and your companions rain blow after blow down on the corrupted moonstone...and the last mighty blow shatters it into a million glowing shards! The debris showers upon you. "Maybe we could have destroyed it with missile weapons? Or by throwing it off a cliff?" You hear a cry: "The Myrmidex are driven mad!" The Myrmidex stumble about, confused. With the queen and the stone gone, they have lost all sense of purpose. Now is your best opportunity to escape. And so you do. Battered, cut, triumphant, you emerge from the Myrmidex caves. At the head of a long column of exhausted and victorious warriors, you return to the Drum Hill...to celebrate! Members of all tribes come for the feast....the largest and most important feast ever held in the Valley of Eodon. Kurak sits beside Yolaru, Pindiro beside Barako, Haakur beside Sakkhra, and peace is sworn between the tribes. You know this peace isn't for you. Soon enough, you will hear the call to action again. 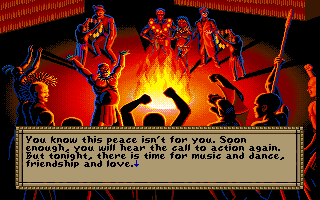 But tonight, there is time for music and dance, friendship and love. At dawn, your past catches up with you...and your future beckons. A vision of Lord British appears before you. "You have done well," he says. "But now I must take you to where you are needed. For the sake of the friends you leave behind, I am sorry. Prepare yourself." You say farewell to Aiela. "Aiela does not know your world. Take her there," she pleads. "Teach her of your world." You shake your head. "My world would strangle you. You must stay. My heart remains with you, but my duty is elsewhere...with him." "Also, I don't want to have to teach you about feminine products. That would just be awkward for everyone." Tears roll down her cheeks. "Abandon duty, and you will not be the warrior Aiela loves. Choose duty, and you must leave. Either way, Aiela loses all...Farewell." You are joined by Spector's former assistant, Fritz, who came out of hiding to fight the Myrmidex, and bears their scars. The moongate appears, summoned by the shade of Lord British. 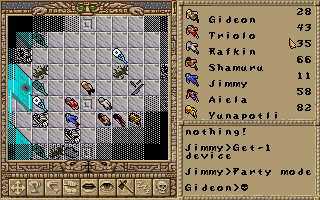 Jimmy, Spector, and Fritz gather their belongings, but Rafkin does not. "I'm staying, my friend," he says. "Someone must. I will stay here...and hope other scientists come. Farewell." Saddened, you follow your friends and allies into the moongate, leaving the Valley of Eodon. Perhaps someday you will return to those you have left behind. And that's it except for the final screen at the top of the post. 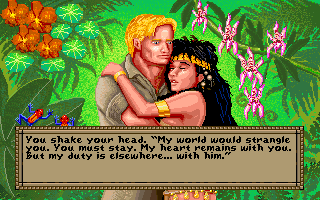 Lord British has managed to yank my chain again, ending the first serious RPG romance that I can recall. There was no explanation about Shamuru, Triolo, and Dokray despite Lord British's shade providing an obvious excuse. Origin missed a real opportunity for the three of them to start cracking up at the end of the game, revealing that they'd just been faking amnesia all along. 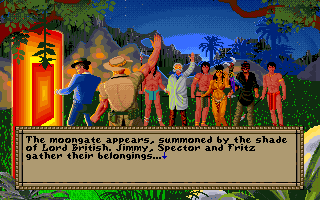 Notice that the three pseudo-Britannians are not among those departing through the moongate. And why is the moongate red, by the way? 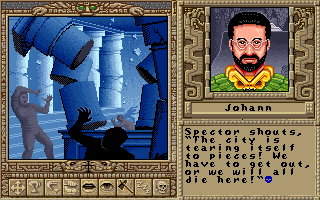 When Lord British said that he was taking me "where I'm needed," I assume he means to Martian Dreams, which I'm 99% sure was the next Ultima game. The wisp in Kotl said that if I gave it valuable information, it would present me "with information of true value." What did it want from me, and what would it have delivered? I ended the game with a "crystal brain" in my inventory. Fritz had given it to me. I never used it anywhere; is this what the wisp wanted? This is going to haunt me, and no site seems to have the answer. I carried a bunch of other things the entire game that sounded useful, but I never found any use for them. They included a digging stick, a key, a vine coiled as a rope, orchids, and a bunch of valuables--a pile of diamonds, gold pieces, a jade neclace, and a tooth necklace. There were inventory slots for rings, boots, and helmets, but I never found any of these things. Were there any? I believe you can get into the Myrmidex caves at any point from the Haakur spider caves. What would happen if a player started a new game, headed right for the caves, and killed the queen without doing any of the other quests first? Is it even possible? Does it change the endgame screens? If the moonstone was keeping Eodon in a space-time pocket inaccessible from Earth, why didn't destroying the moonstone return the valley to Earth? Looking through some walkthroughs and other material (particular thanks to Dino's Guide to the Savage Empire), I discovered a few things that I missed. First, apparently it was possible to enter into a romance with Aiela's bratty adopted sister, Tristia. If you're dumb enough to do this, she completely slams you during your farewells. The Avatar looks appropriately wounded. 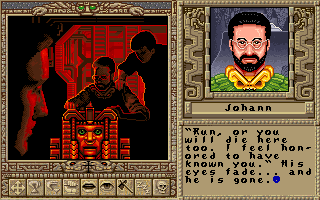 Also, it was apparently possible to find Seggallion, the expatriate from Knights of Legend who appeared briefly in Ultima VI, hiding out on his own plateau. His dialogue doesn't indicate any past familiarity with the Avatar, consisting mostly of Origin in-jokes prompted by various Origin employees' names. Finally, I'll mention that only two of my characters--the Avatar and Jimmy--ever leveled up, and each of them only leveled up once, towards the end of the game. Character development definitely wasn't a major part of The Savage Empire. My one screen shot of leveling up. I'm going to see if I can wrap up Operation: Overkill and 1990 over the next few days as I ponder The Savage Empire's final rating. Like many of you, I've been eagerly anticipating Corey and Lori Cole's Hero-U: Rogue to Redemption. Corey notified me this week that the project has gone into a second round of Kickstarter funding to make up for a budget gap. If you're keen for a Quest for Glory-style game in the next few years, I recommend visiting the page and supporting the project. The project has come a long way, and the official site has some great examples of artwork, dialogue, and gameplay. 2 things about the Myrmidex cave. 2) If you enter the cave BEFORE the endgame "phase" simply the Queen won't be there. Even if you have the navigational device it will point to random places in the cave. 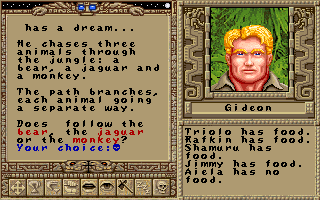 There's also the Triolo "gem" spell I think that shows the map, and will eventually show the big central cave nearby. The device to find the queen is a bit of a revelation. Below, Joe thinks I could have gotten a clue about that in Kotl. It sure would have helped. Boo on the inability to find the queen before the endgame, though. I was thinking about doing a speedrun. Pedro, I agree that the "Eagle Eye" spell is helpful, but it doesn't show a very big area, and the queen is tucked in kind of a side-cave, not the obvious big central cave. The device is already made in Kotl. If you go in the caves before you unite the tribes and use the drum then Myrmidex will spawn behind you as you explore. I don't know about the queen being there or not because I died. Checking that, it looks like Yunapotli (once you return his brain) will tell you about a "device" that shows the way to the black gem, not the queen, but of course they are together. "The Kot-l cre-at-ed man-y in-ter-est-ing de-vices. When the @Myr-mi-dex at-tacked, they al-so cre-at-ed @weap-ons and @arm-or to help de-fend the ci-ty." "One you may find in-ter-est-ing is a de-vice to help @lo-cate the black stone the Myrm-i-dex took." "Most de-vic-es should still func-tion. You may use an-y you find." "It is a round ob-ject with a light which in-di-cates a path towards the black stone." The walkthrough that Chet already linked to says it is off to the north, in a south east room. Probably would have been found by accident if you explored the whole city, but man that place is HUGE. Might be worth a shot if someone wants to do it, but I do not have the time right now. So what happened with the king kong an the impenetrable plateau ? 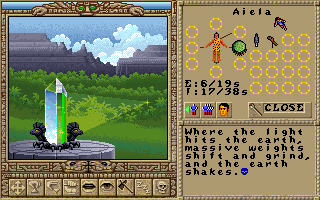 Yeah, I kind of glossed over that with "I finished the other tribal quests in short order," didn't I? To get up on the plateau, I had to enter a nearby cave, but the cave was blocked with a stream of water from a waterfall. 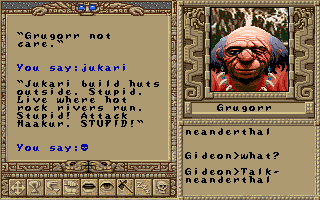 So the quest involved hucking a bomb up to the top of the waterfall and causing a boulder to fall and block it, then enter the cave, then defeat the ape (who is no more difficult than other great apes in the game), and talk to the girl to get her to go home. There are a couple of places in the game where you have to throw a bomb to move a boulder, and in both cases the boulder looks the same (and not like other boulders in the landscape), so it's somewhat obvious. Multiple romance options, that's pretty neat. It seems like the rpg credentials of this game are, in some senses, slim. If the combat was fairly trivial and character development non-existent, that basically leaves you with an adventure game. In terms of combat, Martian Dreams was even worse due to a bug with an item that makes (non-scripted?) enemies disappear on thin air. Also, do include a Rhythm mini-game, while you're at it. I heard Bard's Tale IV will be Guitar Hero with Light RPG elements. Where was the peanut gallery when someone named "Japanese Games Are the Best" insisted on commenting on every post? We couldn't poke fun at that without sounding ethnocentric or racist. I particularly like the idea of Bard's Tale IV giving you more powerful effects if you play the Bard tunes correctly. Also this should be the cue for some discussion of Shin Megami Tensei and how it compares to Savage Empire. RPG with rhythm minigames? How about including RTS minigames and making it open-world? Brütal Legend! Then "Crypt of the Necrodancer" is what you're looking out for. Or the PC rhythm-RPG "Sequence". The digging stick could be used on a riverbank to collect clay which you can use as part of the bomb-building process. Or, you know, just steam the clay or the soft clay pots from someone else. The vine/rope can be used to descend into the Myrmidex caves early, if you can find one of their nest entrances. If you place a rope at the entrances before the final confrontation, you can get back to the surface to rest and heal during the final dungeon. I read that you can win the game early if you can defeat the queen before uniting the tribes, but I do not know if this is true. The crystal brain belonged to the second automaton you meet just inside the Kotl city. It was stolen by Fritz. I did not return it to him as I did not get the brain before I collapsed the city, but in the game he says that he'll be able to remember the events more clearly because he has it. Looking at a walkthrough, I *think* with the brain he remembers where a device that will allow you to track the queen ant will be, simplifying the final dungeon since you will have to explore less. In any event, there's an item in the game somewhere that does that, but I never found it and won the hard way, as you did. I am glad you conquered the King Kong subquest. That I had to look at a walkthrough for help. I did not find the cave behind the waterfall in my explorations-- or rather, I found the waterfall and did not notice the cave. Even once I found it, I never imagined that you could lob a grenade from below to knock the boulder towards you. It's a bit of a physics puzzle that doesn't make much sense. Thanks, Joe, for solving those mysteries. I guess this highlights a problem with the game. It's cool that you can use the digging stick to collect clay to make a soft clay pot, but it's hardly necessary because there are soft clay pots lying about everywhere. It's cool that you can use a soft clay pot in a kiln to make a hard clay pot, but it's hardly necessary because there are hard clay pots lying around everywhere. It's nice that you can use a hard clay pot to make a bomb, but it's partly unnecessary since you get a ton of explosive devices in Kotl. If you're going to make so much stuff interactive, give me a reason to use it! Nhgbzngbaf, yvmneq crbcyr, orshqqyrq pbzcnavbaf, n tvnag ghegyr, qvq gurl erplpyr n srj vqrnf sbe frecrag vfyr? Frecrag Vfyr pevof dhvgr n ovg sebz Znegvna Qernzf nf jryy - nhgbzngbaf, yvsryrff pvgvrf gung ghea bhg gb or yrff guna yvsryrff, pbybavfgf neevivat sebz n qvfgnag ynaq, obgu tnzrf rira unir n znq zbax! There are, in fact, no rings or boots or helmets in the Savage Empire. 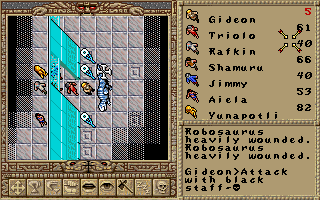 The slots for those are just a part of the Ultima VI engine that this game does not use. Come to think of it, I'm pretty sure that when I played this years ago I never figured out what the Wisp wanted from me either. I think the Wisp is foreshadowing another game in the future. He's not at Origin anymore, obvs, but Lord British is pretty active on twitter, you could communicate your success to him there if you want. I was thinking I'd do that if I ever met him in person, but probably he's heard it before. In that case, I'm going to go "Ho eyo he hum" till I reach the word limit. Chet certainly deserves a wall of accolades from Lord British! If only all the old game designers still did that, Chet would have quite the trophy room! Congratulations for finishing this game and for stabilizing your housing situation! The quest log struck me as a really important innovation. I was going to say that it was funny to see the first "quest log" in a comparatively minor title, but the truth is, it's the minor titles that seem to do the most innovating. The major titles just aggregate the best of what the minor titles invent. 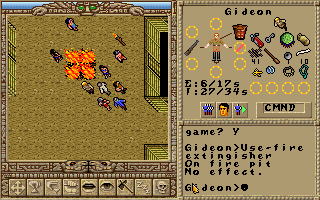 I'm trying to think of other particularly satisfying CRPG animations. 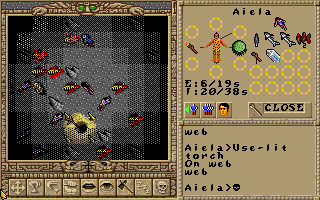 Holding down the 'attack' key in ADoM against swarms of weak critters. I'm sure i'm missing some of the best ones. "Fireball" in just about any D&D game. Backstabbing in the Infinity Engine games. "Chunking" in the IE games, even though it doesn't make any sense. Fallout 3/New Vegas non-VATS head-shots. 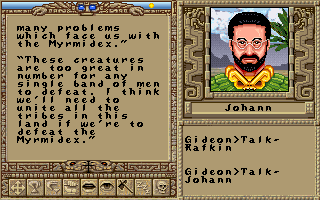 Exposing the king's true identity in the first Might & Magic RPG deserves an honorable mention. It was startling at the time. 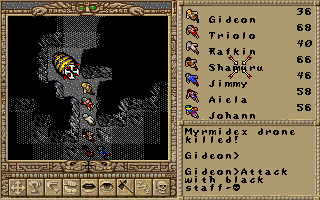 "Planescape: Torment" provided many animations but ended up looking over-the-board flashy. Man, I found that final labyrinth a real headache when I played. All of the caverns up to that point were so easy that they didn't need to be mapped at all, so I was well into the final labyrinth before I realised I was utterly lost. Because it's not a square-grid type game, I couldn't even figure out a reasonable way to map. I even tried the old trick of ditching useless equipment at junctions to at least tell me which paths I had already taken, but the equipment would (very quickly!) disappear. When I eventually and shamefully consulted the map you've posted above, it was annoying to realise that I had walked very close to the queen on more than one occasion. Anyway, one of the things I did really like about the game was its non-linearity. 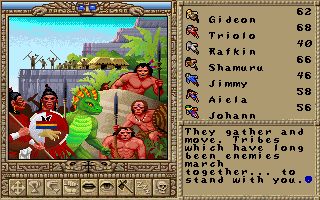 You have a lot of options on where to go and in what order to solve the various tribal quests. Unlike you, I spent a lot of time early in the game wandering around near the Sakkhra caves and fought loads of Myrmidex; if I had had a nuke in that final labyrinth, I would have cheerfully chucked it in, Ender's Game style. I too found the underground alien city very large and very disorienting, and only realized after the game that I had left a lot of really useful stuff there. Your last sentence perfectly describes my experience with Kotl. The caverns with the queen remind me of Faery Tale Adventure's witch's castle hedge maze. 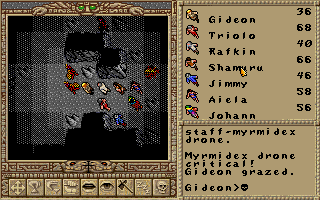 And it went partways underground, so you couldn't just cheat using Bird Totems to map the maze from above. I remember that there were some places in the game that were only accessible through felling the large trees with either the fire axe, or by throwing a grenade at them. I think that the Seggallion region involved grenading a tree on the other side of a chasm to reach it?